The following creations will fit the Iplehouse Fid doll. They are being modeled by my Grace (medium bust). This gorgeous creation is done in a pink, gray and white embroidered french lace. The corset style top is adorned down the center front with pink pearl glass beads, fully lined in a pale pink bridal cotton and closes in the back with snap closures. The skirt is done in two gathered layers of the same lace, fully lined in a pale pink bridal cotton and has an elastic waistband. Doll is not included. Fairy or Princess your Fid girl will look stunning in this creation. Created in a white, turquoise and aqua embroidered french lace, this dress has two layers of gathered lace for added fullness, fully lined in a white bridal cotton and adorned around the waist with a turquoise satin ribbon and bow. The straps were created from the same lace and this dress closes in the back with two snap closures. Doll is not included. This sweet summer dress is done in a white, pink and green embroidered french lace. 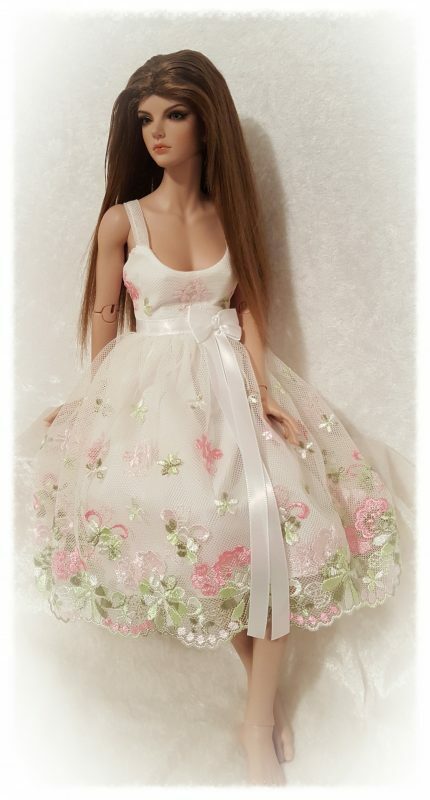 The dress is fully lined in a white bridal cotton and adorned around the waist with a white satin ribbon and bow, this dress closes in the back with two snap closures. Doll is not included. White french lace lingerie. Delicate and sweet this set includes the cami style top, adorned down the center front with a white entredeaux lace and white satin ribbon, trimmed in a white crochet lace. The french cut bikini bottoms are a perfect fit and trimmed in a white crochet lace, also included is the white lace choker. Top and bottoms have stretch and slide on and off the doll. Doll is not included. $24.50, includes u.s. shipping and tracking. All other countries please contact me for shipping rates. 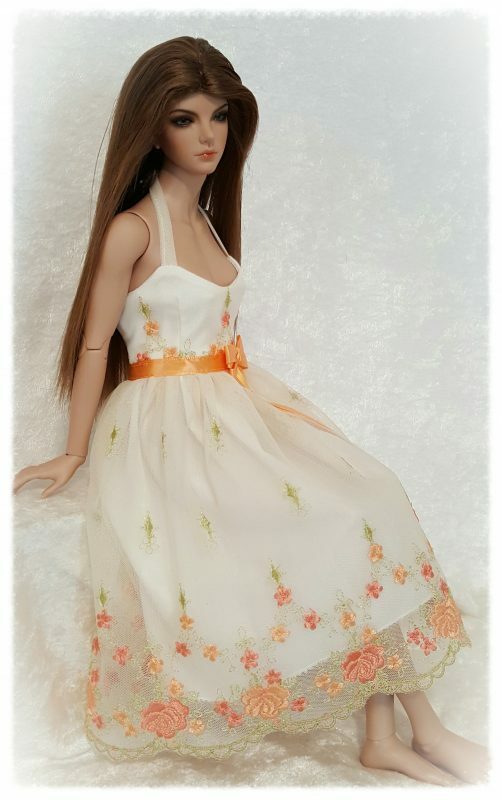 This gorgeous dress was created in an off white french lace with pale orange and green embroidery. The dress is fully lined in a gathered white bridal cotton fabric for added fullness. 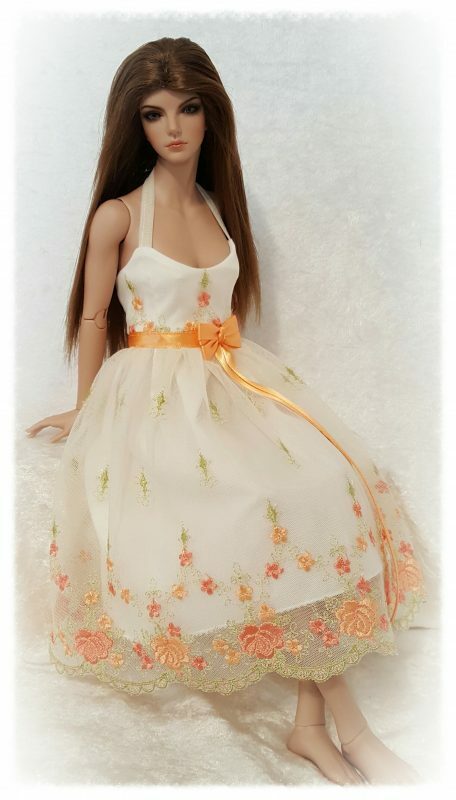 The waist is adorned with a contrasting satin ribbon and bow, the straps attach behind the dolls neck with a snap closure and the dress closes in the back with two snap closures. Doll is not included. $34.50, includes u.s. shipping and tracking. All other countries please contact me for shipping rates. 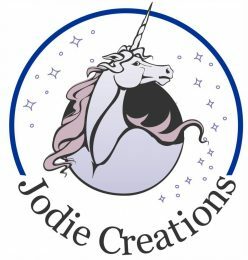 If you see a creation on my website and want it for a different doll feel free to contact me.